People have always been afraid of technology doing scary things like taking over the world or reading our thoughts. A research group at UC Berkeley is actually trying to make that second one happen with technology that combines functional magnetic resonance imaging (fMRI) with computational models to actually see what people are thinking about. It’s the kind of freaky technology that Hollywood blockbusters are made of – and it’s 100% real. The researchers say that the technique could be used in the future to tap into the minds of coma patients or to share things that no one else can see such as our dreams or memories. But right now, in the infant days of the technology, it can only be used to reconstruct movie trailers the subjects recently watched. 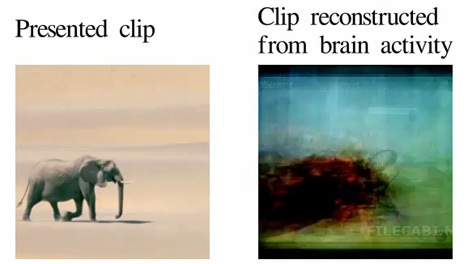 Still, taking images from a brain and reconstructing them on a screen is pretty impressive. To conduct the experiment, the researchers developed a huge database of random YouTube clips. 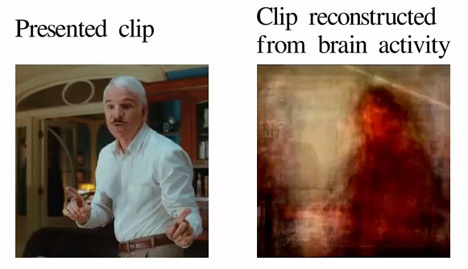 They then associated these clips with brain activity patterns based on previous brain-watching sessions with the fMRI machine. Once the database of images and brainwave activity was established, it was only a matter of feeding brain scans into the software. The software picked out the 100 clips most likely represented by the brainwaves and layered them together into a single video for each scan. We might be a couple of decades away from using this technique to communicate with comatose patients, but this demonstration is so cool it’s spooky.